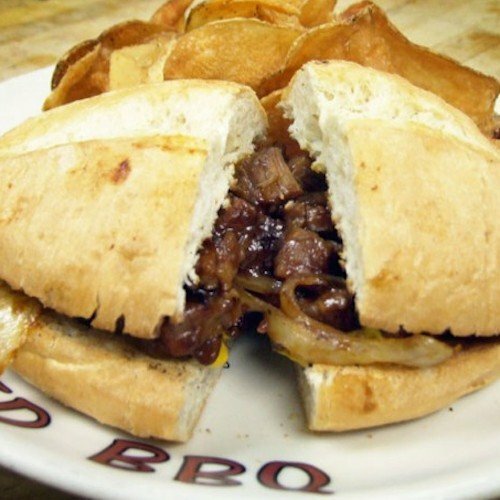 From the Kitchen: Beef Brisket Dip Sandwich | Stahancyk, Kent & Hook P.C. Preheat the oven to 350 degrees and season brisket with salt and pepper on all sides. Place oil in Dutch oven or large deep pan and heat on medium-high. When hot, about three minutes, brown the brisket on all sides then remove it and reserve on a platter. Reduce heat to medium and add onions to the pan, cooking until softened (about eight minutes). Add the garlic and cook for two minutes. Add the BBQ sauce, beef broth and bay leaves and bring to a boil, then reduce to simmer. Place brisket back in pan, cover, and place in oven for three hours. After, brisket will be very tender. Take out of pan and let rest on cutting board. For the sandwich, slice the roll, spread horseradish on both sides, and place three or four slices of roasted red peppers on the bottom side. Place four or five thin slices of brisket on top of peppers. Braising liquid can be placed in cups for dipping.